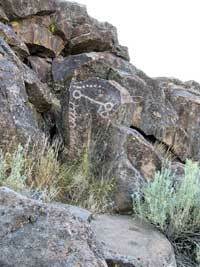 Petroglyphs in the foothills of the Sierra Nevadas. A site steward recommended the following guidelines. A lot of this is intuitive, but it is easy to forget to note something in the field, and then remember it only after you get home! Orient a scale map of the site. Record setting -- date, time and weather. (We had been puzzled by a tombstone -- by chance, I viewed it at a different time of day, and then we realized that what we thought was the front was the back, because we saw faint raised letters visible at 2:30 pm on a sunny day in Jan! Take photos from a consistent spot (fixed photo station). 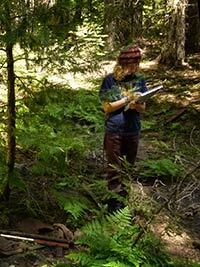 It's easier to detect alterations that way and track natural changes. Note the presence/absence of vehicle tracks; footprints; signs of animal disturbance, or water/wind disturbance; evidence of human disturbance; litter; vandalism or missing artifacts; changes in access roads/trails/campsites; and changes in water channels, rock falls, other natural occurrences. If any of these are present, then describe and photograph them.